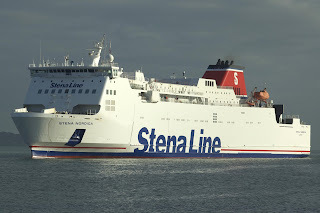 Thoroughly fed up with hanging around in airports and wondering if my bag would fit in the dreaded luggage frame, I decided for a change to check out four Stena Line routes: Dublin-Holyhead, Fishguard-Rosslare, Belfast-Cairnryan and Liverpool Birkenhead-Belfast. With a free week on my hands I booked my foot passenger tickets in the smug knowledge that I could bring as many bulky bags as I wanted on board — plus golf clubs, a surfboard and a bike if I so chose — at no extra cost. I don’t happen to own golf clubs, a surfboard or a bike (I do have a set of darts), but if I had they could have come with me and it wouldn’t have cost me a penny extra. Granted, I’d have looked a right eejit cycling one-handed with a golf bag over my shoulder and a surfboard under my arm, but the point is I had the choice. And better still, no one was going to charge me 40 quid for forgetting to check in online. So, taxi booked to take me to Dublin Port, off I set on a sunny Mothers Day morning for Holyhead on the first leg of my two-part Stena adventure. Or to be more accurate, misadventure. All four ferry crossings were plain sailing. Actually, having upgraded to Stena Plus they were plush sailing. But as so often happens when I set off on a trip, be it near to home or distant, as soon as I set foot outside my front door someone somewhere along the way has got it in for me. And that for me is what makes travelling such a joy. The unexpected can throw up challenges that would have the toughest of tough guys blubbering like babies, but me, I just laugh (though I draw the line at me arriving at one airport and my luggage arriving at another). There were plenty of challenges and laughs as I went back and forward between Ireland, Northern Ireland, England, Wales and Scotland, crossing by sea and travelling by bus and train; I found myself in umpteen daft situations and met many colourful, delightful and crazy people; and when I finally arrived back home in Dublin at the end of eight incident-filled days, I couldn’t wait to tell the lads who’d ridiculed my plan that flying is for the birds and taking the boat is a ferry fine way to travel. I was stranded on a train going nowhere after a truck carrying a load of cheese got stuck under a railway bridge in North Wales. I trust the traffic cops warned the guy behind the wheel to drive more Caerphilly next time. •The groom who chose the worst possible moment to tell his stout-swilling best man a joke. And that was only on the first two legs, from Dublin to Holyhead and Fishguard to Rosslare (next week in part two I’ll tell you about my jaunt around Scotland and England when I travelled from Belfast to Cairnryan and Liverpool Birkenhead to Belfast). The bridge strike meant the train I was on from Holyhead to Shrewsbury couldn’t proceed beyond Shotton. We’d been sitting there twiddling our thumbs for nearly an hour when the guard announced that a replacement coach would collect us from outside the nearby Central Hotel “in 10 minutes” and take us to Chester from where we could continue our journeys. Fifteen minutes passed and there was no sign of a bus. Half-an-hour later there was still no bus. After 50 minutes I gave up waiting, deserted my grumbling fellow passengers and, thinking dark thoughts about errant bus drivers being Shotton sight, popped into the Clwyd Hotel for a beer. And that’s where I encountered Barry, the worst horse tipster in Britain, who was standing at the bar reading the Daily Mirror racing pages. After a few minutes Barry, who was well into his 70s, took the pen from behind his ear, circled a horse’s name and told his three elderly buddies: “Kempton, 3.50, Tuxedo. Put your shirt on it.” His pals scoffed, sniggered and called him names, then the loudest of the three said he wouldn’t back one of Barry’s fancies even if it was the only horse in the race. Barry was clearly a tipster in whom the shirtless betting public of Shotton had lost all faith So I’d love to have seen their faces later when his selection romped home at 11/1. I never got the chance to buy him a drink from my winnings — I’d nipped into the Ladbrokes down the street after finishing my pint and, for the hell of it, stuck a tenner on Tuxedo to win. It was a Welsh rare bit of luck, and took some of the sting out of having been charged £6 an hour for wi-fi access in my digs in Holyhead the day before. The Boathouse Hotel is a comfortable, well-run establishment with wonderful staff and a restaurant serving tasty, wholesome food, and I’d happily stay there again. At £40 a night for a single room it’s reasonably priced, but £6 an hour to check your emails is not on. Holyhead looked a bit down on its luck, sort of faded and flaking, when I stepped off the Stena Nordica (you should see the cabins, they’re like something out of a posh hotel) from Dublin, but first impressions are so very often misleading. It’s true the town centre could do with a lick of paint and has more than its fair share of empty locales, but a pleasant stroll revealed a lesser-known lovely side to the ferry port that for generations has been the arrival and departure point for Irish people travelling to and from Britain. The ice cream van parked on the hill known as Newry Beach was doing a roaring trade as families made the most of the fine start to the day before mums and grannies where whisked off for a slap-up Mothers Day lunch. I was feeling peckish myself despite having earlier tucked into a fry (Anglesey free range eggs, back bacon from Cigydd y Fali, pork sausages from Edward’s of Conwy and Clonakilty black pudding with rosti potatoes, portobello mushrooms, beans and grilled tomatoes) on the ferry over. None of the young St. Patrick’s Day revellers on board seemed keen on breakfast, but having seen thousands like them out and about in Dublin just a few hours before, it was no surprise. I guess they’ll have recovered by the time Arthur’s Day comes around in September. A blackboard outside the King’s Arms informed passers-by it was part of the Fursty Pub Company. With the early afternoon sun beating down on my threadbare scalp I was becoming very fursty, so in I went and managed to nab the last free stool at the bar in the lounge. A sign on the wall warned: “Notice to patrons — shouting and bad language will NOT be tolerated.” An admirable sentiment, but another sign reading, “Notice to children — running around screaming your heads off and poking travel writers in the ribs with plastic pirate swords will result in parents being heavily fined and jailed,” wouldn’t have gone amiss. Having narrowly avoided being filleted by a cutlass-wielding five-year-old buccaneer (who was lucky not to get a clip around his buccaneer), I consoled myself with the knowledge that the homemade steak pie with mash, peas and gravy I was eventually allowed to finish in peace was delicious and cost just £5. I don’t know if the phantom coach to replace the train going nowhere ever turned up. If it did, it was long gone by the time I swaggered out of the bookies with £110 of Ladbrokes’ lolly plus my £10 stake in my pocket and jumped aboard a double-decker for the short journey to Chester. I decided to spend the night there, and it proved to be a wise decision — it’s a fabulous place. What didn’t prove to be a wise decision was my asking a souvenir seller, a born and bred Scouser who looks like the late actor Pete Postlethwaite, to recommend a pub, because the following exchange ensued. “Well, I always go to B&Q,” he replied. “Is it for inside or outside?” he asked. We both twigged at the same time. Fortunately, the Marlborough was open, and conveniently it was right next door to the Blossom Hotel which was my home for the night. If you like your ales, the Marlborough has a great selection, but if you’re afraid of dogs I’d think twice about popping in because it’s one of the favourite pubs of the world’s biggest Irish wolfhound pup. Sixteen-month-old Max weighs more than 12 stone and stands six-foot-four on his back legs when he puts his front paws on his master’s shoulders. Despite his intimidating size Max is a gentle giant, and together they’re a popular sight when he takes his owner Geoff out for walkies — or rather, draggies — every afternoon. He’s such a powerful pooch, though, that a collar and leash are useless and Geoff has to keep him on a bridle. Cardiff was my next port of call as I made my way to Fishguard for the return leg of my journey. I’d never been in the Welsh capital, but during my brief visit I was impressed enough to stick it on my list of weekend destinations for later in the year. I was also impressed by the lunchtime pies in the Goat Major pub, opposite the splendid castle, which was the scene of a most unfortunate but very funny incident, though it was all I could do to stop myself from laughing for fear of getting a dig. A young guy who was getting married later that afternoon popped in for a nerve-calming pint with his best man, his father and some male friends, and before long the jokes were flying. Which was all very well, except the groom made the terrible mistake of delivering the punchline of a particularly funny story at the very moment the best man, who was standing right in front of him, took a swig of stout. I’ve never in my life seen such looks of horror. The groom’s white shirt looked like Jackson Pollock had got to work on it with a bucket of brown paint. There was silence. Then a single loud expletive. Then a couple of minutes of mass panic like something out of a cartoon while damp cloths and sponges were called for before one of the lads — there’s always a hero in these situations — rode to the rescue. “Here, take my shirt,” he said as he began undoing his buttons. “I’ll nip round to Top Man and buy a new one.” And so a blushing bride somewhere in Cardiff was spared the shame of marrying a man in a white shirt splattered with porter-tasting polka dots. Guesthouse owner Tony Jacobs, who describes himself as an ageing crooner and is the leader of the Tuxedo Jazz Orchestra, was waiting for me when I got off the train at Fishguard Harbour. His wife, Mary, whose elderly parents are from Cork city, is an occupational therapist, and together they run what for me is the best B&B I’ve ever stayed in. On top of that, Pentower (http://www.pentower.co.uk/) has breathtaking views of the harbour from the terrace, where I watched the Stena Europe ferry arriving from Rosslare. The Jacobs have three pet cats, and it was their fondness for felines that threw up the funniest story of my journeys. A couple of years ago, one of their moggies was in a huff and bit a guest. It wasn’t much of a bite, more of a nip, really, but Tony and Mary were mortified — even more so when they later found out what she did for a living. “I’m a lawyer,” she said. “I specialise in personal injuries claims.” Fortunately, she saw the funny side of it. On the way back to Rosslare I reflected on what had been four fabulous and fun-filled days at sea and on the road. Surely my next ferry trip, to Scotland and England, couldn’t possibly be as incident-filled? Well, as horse tipster Barry’s scoffing pals said in the pub in Shotton, I wouldn’t bet on it. Hop aboard next week and I’ll reveal all. 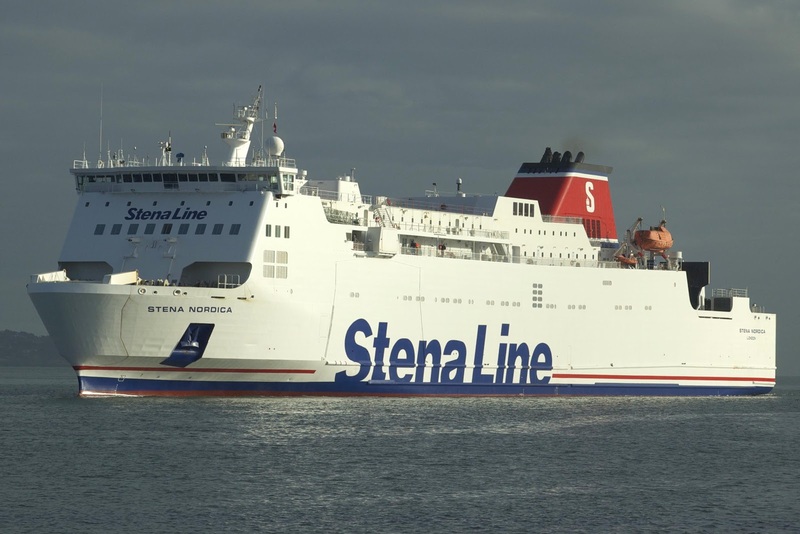 Stena has come up with more than a dozen good reasons to travel by ferry on its Irish Sea routes in 2012. Door to Door service: Take the car on board and enjoy the freedom of travelling from your home direct to your destination, with no transfers or expensive airport parking involved. Don’t hang around: Check-in is only 30 minutes in advance, beating the much longer airport check-in times and leaving you more time to prepare for your journey. Squish it all in: Travel by ferry and feel free to bring the kitchen sink if you want. Child’s Play: Start your holiday fun as soon as you step on board with loads to see and do including kids’ fun zones, cinemas and free wi-fi. Shhhh: Sleep like a baby in a comfy and surprisingly luxurious cabin. Mouthwatering food: Choose from Stena’s new Taste restaurant, the Metropolitan Grill or Barista Coffee House. Man’s Best Friend: Pets can travel in style with you. Stretch out: With no restrictions on leg room you can comfortably stretch out and relax or move about and explore what the ferry has to offer. Save your pennies: There are no hidden charges, so what you see when you’re booking is what you pay. It’s good to talk: Use your phone and iPad while you travel without restrictions — there’s no need to turn it off. Shop till you drop: Check out the onboard shops which offer great savings on fragrances, spirits, designer handbags and much more. Keep fresh: Bring all your toiletries on board without the need to stick to a 100ml limit. Don’t lose your shoes: Stay fully-dressed as you move through security with no need to remove boots, belt and accessories. Treat Yourself: Upgrade and enjoy all the advantages of the Stena Plus Lounge with complimentary snacks, beverages and newspapers. Stena Line’s head of PR and communications, Diane Poole, OBE, said: “The reasons why so many families choose ferry travel are simple. 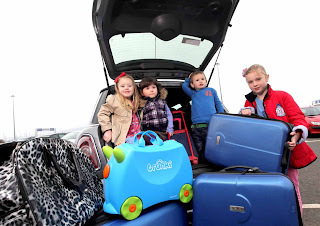 “Most importantly, ferry travel offers the convenience of packing as much luggage as you like into your car and driving from your own doorstep direct to your destination with a comfortable and enjoyable sea crossing in between. “Stena Line offers a wide range of family-friendly entertainment and refreshments from free wi-fi and free movies to a Curious George play area and iPads and Xboxes for teenagers. “There’s also fantastic on-board shopping and a great selection of food and beverages including family meal deals, so there’s something to keep everyone happy during the journey. “With more routes, more choice and more flexibility than ever before, ferry travel is a convenient, relaxing and hassle-free option for families. With a family of four being able to travel from as little as €119* single by car, it offers tremendous value in challenging economic times. *Single economy online fare is valid for midweek travel on the Dublin Port to Holyhead and Rosslare to Fishguard routes and generally requires booking a minimum of 21 days in advance of travel.